Raising Money$mart Kids: Is Your Teenager Money-Savvy Enough to Go to College? Is Your Teenager Money-Savvy Enough to Go to College? Credit card debt is at an all-time high across the country. 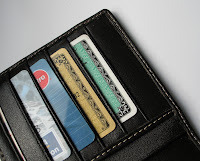 According to a Nilson Study, 78% of American households had at least one credit card. Credit card default is also at an all-time high, especially in the 18-24 year old category- mainly college students. The ease of obtaining a credit card in the first year of college and a lack of basic financial literacy join to make this the most vulnerable group of consumers. I'm a bit worried about one of ours. The other two had done just fine after going a week or two living on Ramen soup. Luckily, they learned quickly. I may have been a bit too intense when describing the risks of credit card debt. Our 27 year old doesn't have one but (and I don't think parents can do this any more) he has a credit card history because I got a card under his name when he was 5 years old and occasionally charged and immediately paid off $100 about 2 or 3 times a year. His credit score is nearly 800 or close to the highest possible number. He shows at least a 20 year credit history, without ever having a credit card in his hands. I've since buried that card somewhere. I may take it out and have him spend another $100 and then pay it off just to keep the card active. What Do We Teach Our Kids About Money?